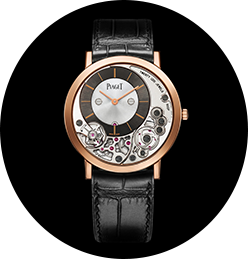 Ultra-thin horology lies at the very heart of Piaget's history and culture. 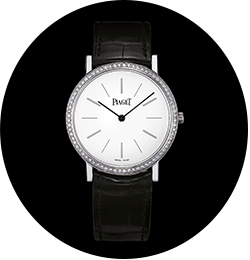 Since the 1950s, the legendary 9P and 12P movements have inspired a line of ultra thin and high-performance calibres. 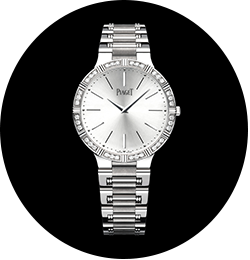 The Piaget Altiplano collection owes its name to the high plateau stretching across an extensive part of South America and distingquished by its strikingly pure landscapes. The astonishingly slender Dancer and traditional watches find their way unscathed through time with their timeless and recognisabel aesthetic.The traditional watch with its pure, retro-chic lines is distinguished by a dial featuring gem-set hour-markers and a mesh bracelet adorned with twisted wires welded to the links and entirely hand-assembled in our workshops. The incredibly supple gold bracelets of the Dancer and traditional watches literally flow around the wrist and are smoothly adjustable to guarantee a perfect fit. 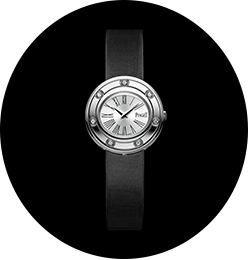 Most of these models beat to the cadence of caliber 430P, a 2.1 mm thickness mechanical ultra-thin hand-wound movement. 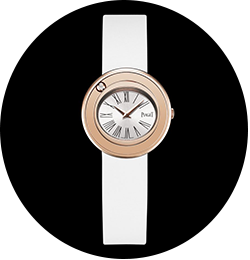 The astonishingly slender Dancer and traditional watches find their way unscathed through time with their timeless and recognisabel aesthetic. 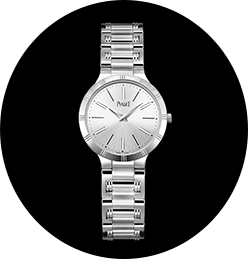 The Dancer watch is a paragon of classicism and elegance that adopts a pure and original style thanks to the double gadroons marking off the graceful ballet of the hours on its bezel and its bracelet featuring matt and polished links. The Limelight collection is entirely at home in the spotlight and plays the star with natural ease and panache. 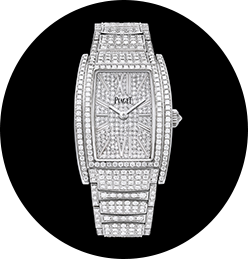 A worthy heir to the first Piaget jewelry watches and faithful reflection of the brand’s flamboyant inventiveness, Limelight is an open invitation to stride the red carpet. The silhouettes of its models are carved in gold and showered with precious stones. The subtle equilibrium of the shapes and proportions suggests a meticulous study of lines and curves worthy of the most prestigious Haute Couture houses. 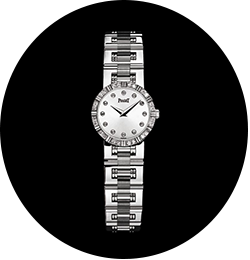 Cuff watch, secret watch or jewelry watch: each causes a sensation in its own specific way. The 1960s were pervaded by a resolutely fanciful spirit. 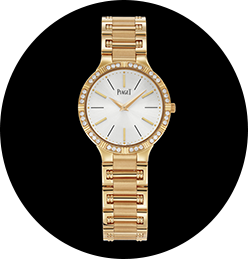 Piaget adorned the elegant women of the time with dazzling jewelry watches. 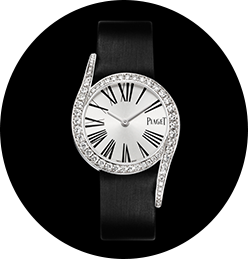 In tune with its incomparable aesthetic, the Limelight Gala collection establishes itself as the new Piaget icon with its incomparable aesthetic, sensual curves and precious gem-setting. 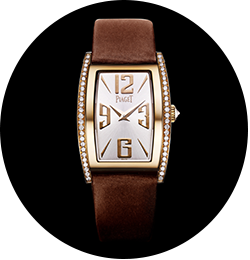 It reveals a distinctive personality imbued with a sense of glamorous chic. 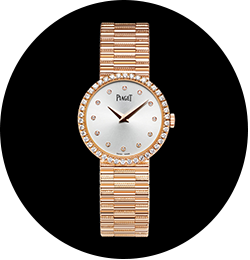 Through the captivating motion of its bezel, the Possession watch constantly plays with time, floating on Piaget’s inimitable creative inspiration. An inverted-set brilliant-cut diamond, subtly raised in a way that makes it easy to grip, pulls the bezel in its wake and invites the wearer to perform a gesture that quickly becomes addictive. The interchangeable wristbands provide endless scope for playing with materials and moods. Perfectly echoing the jewellery collection in which movement is the keynote, the watch proudly proclaims its seductive game.